Throughout history different cultures and civilizations have adopted a main ingredient as basis of their alimentation. If someone thinks of China one would think about the rice and if someone thinks of Mexico one would think about the bean or “etl" in Nahuatl. The bean has constituted the basis of the Mexican food for millenniums. It is a highly nutritious legume due to its high content of fiber and protein . It is also very economical and varied since in Mexico around 50 different types of beans are grown. Now imagine preparing a soup full of history, highly nutritional and carrier of the authentic Mexican flavor. That’s the black bean soup, which you have to prepare and experience! In this soup the beans are served ground, which are seasoned in a broth that has the combination of many flavors . Then over the soup some cheese and cream is put to garnish and diversify the dish texture. It really is an excellent entree dish. To make this soup only easy things have to be made. For this recipe cooked black beans are needed, which can be bought canned but we truly recommend preparing the pot beans recipe and the flavor will be magnificent. Do even the impossible to get the epazote and use it in this recipe. You will be amazed with all the aroma that it provides. In this soup chicken stock is used and a stock with a Mexican touch can be used. Blend very well 2½ cups of cooked black beans with broth, then reserve. Finely chop 1/3 of an onion and 1 garlic clove; then set aside. Mix the saucepan ingredients and fry them for approximately 1 minute, until they look a bit transparent; stir regularly. The cooked Black Beans that were blended. Bring the broth to a boil over high heat. When the broth boils reduce to low heat and cook the black bean soup for about 8 minutes, until it thickens a little; stir occasionally. When the cooking is done discard the 2 epazote sprigs. Recommendation: This soup can also be garnished with fried tortilla strips. Variation: Know this soup in the version of a cream. Did you like the Bean Soup? ≎ Mexican Food with Beef. This epazote will do the job of giving a unique flavor to your soup. 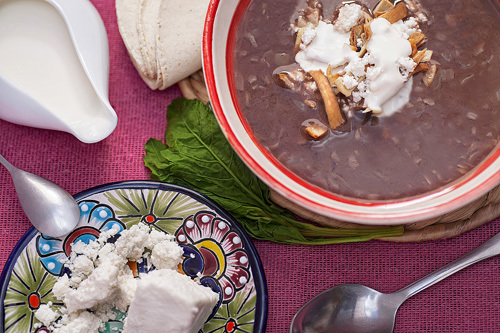 Use the “Goya Black Beans" to make the soup because they are of very good quality. Decorate your table with some nice crystal Mexican glasses. These glasses are handmade and the Mexican spirit will be felt at your table.